On November 29, 2018 the Congress Center of First Moscow State Medical University named after I.M. 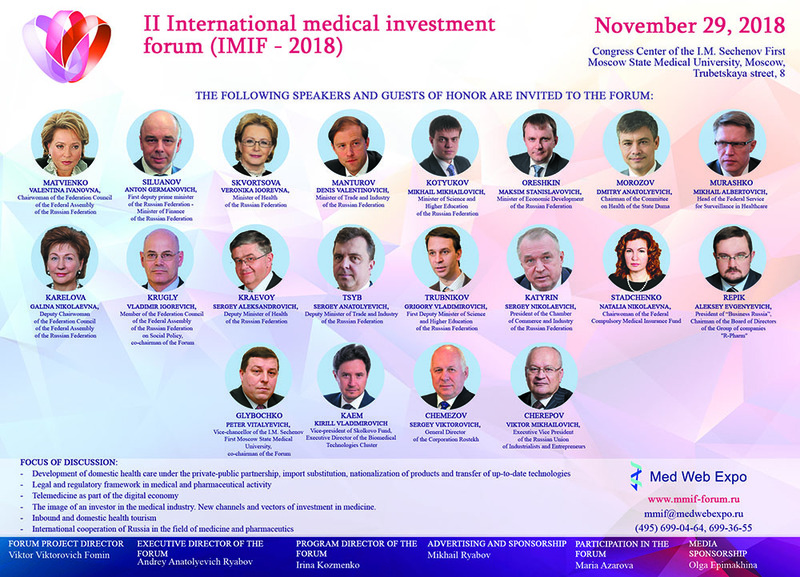 Sechenov will host the II International Medical Investment Forum (MMIF-2018). The Ministry of Industry and Trade of the Russian Federation traditionally takes part in this event due to the high importance of the health sector for the country's economy. Objectives to increase life quality and expectancy of Russian citizens were stated in the Address of the President of the Russian Federation to the Federal Assembly of the Russian Federation, fixed in the May decrees of the President. The International Medical Investment Forum is a full-fledged platform for dialogue between government and business, medical and pharmaceutical industry workers, scientists and investors. A large number of investment projects, research, development, new medical equipment and preparations will be presented at the Forum, contracts and agreements between major Russian and international medical companies will be signed. The forum will be a unique platform for international exchange of experience and advanced technologies in the field of medicine, health, biotechnology and pharmaceuticals, will strengthen cooperation, attract investment and implement joint projects.